(CNN) – A television ad from Mitt Romney's campaign airing in Miami pegs President Barack Obama to Hugo Chavez and Fidel Castro, notorious dictators widely reviled among Cuban Americans. 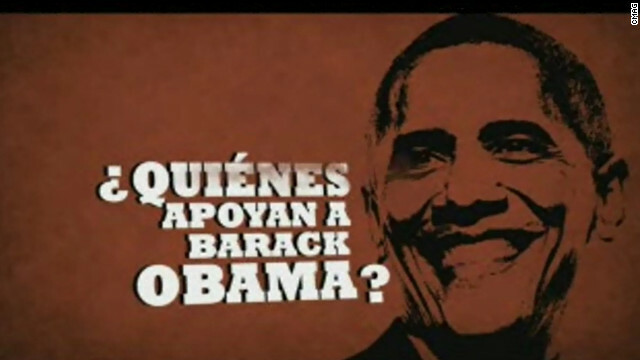 The ad spotlights endorsements from Chavez and Raul Castro's daughter Mariela, who both said they would vote for Obama if they could. According to ad-tracker CMAG, the spot aired Tuesday. "Who supports Barack Obama?" a narrator asks in Spanish before clips of the two endorsements run. "And to top it off, Obama's Environmental Protection Agency sent emails for Hispanic Heritage month with Che Guevara's photo," the narrator continues in the spot, referring to an internal email at the EPA. The agency later said it was sent in an unofficial capacity. Chavez announced at the beginning of October that if he could vote in the U.S. election it would be for Obama. The leftist leader and strong man, who has used strong anti-United States language in his political rallies and official speeches, told state-owned VTV, "In the point of view of his politics, if I were voting, I would vote for Obama and I believe that if Obama was from Caracas, he would vote for Chavez, I am positive." Latino voters, who are particularly concerned about Chavez's rule of Venezuela, make up a voting bloc seen as crucial this year. While non-Cuban Latinos overwhelmingly support Obama, according to polls, Romney and Republicans hold an advantage among more conservative Cuban-Americans. A poll of likely voters in Miami Dade County released last Sunday showed Romney leading Obama among Cuban Americans, 78%-19%. Dan Restrepo, an Obama campaign spokesman and former special assistant to the president, said Romney "continues to play Hugo Chavez's game, giving Chavez the attention he thrives on and that he doesn't deserve." "Keeping America safe and advancing U.S. interests requires the kind of leadership President Obama has provided, not Romney's bluster," Restrepo said. GOP never ending bashing. Musliim, Communist, Marxist. Who would vote for anythingthe GOP says. They are the worst party ever. Name calling and flipflopping. With the ads by the GOP that are clearly based on lies, I find it totally ignorant of the American public that can still support this GOP party and candidate. Remember that when you vote , you are voting for the party, not just the candidate and you will have to live for the next 4 years under the same repression and ideology that you see in the campaign they waged to get in at any cost. When President Obama is relected, these lies will come back purge the GOP hopefully and bring the grand old party back. Romney is not the grand old party! The problem is the POTUS does have a record to run on its just that the Republicans only want to see half of it. They only want to see the part where they say that the economy is doing bad but not the whole story as to how it got like this. But then that was the plan the whole time because the republicans knew that after Dumya Bush that a republican would never be elected next. So they made the economy so bad in hope that the american people would vote a republican back in. They didnt think that Obama was capable of stopping the bleeding. Sorry he did. IF OBAMA IS A CHAVEZ OR CASTRO THEN WHY ARE CUBANS/HISPANICS STILL TRYING TO ENTER THIS COUNTRY. The sad part about this GOP ad is it insults the intelligence of Cuban/Hispanic voters who are well educated, speak and understand English to know our President is not a Chavez or Castro. I suspect John Sununu is behind this one and he should be deported back to Cuba because he needs to learn how to be American. People like Romney gain attention when the masses have fear. He is backed by a freightening group of extremists in the US like the TEA party who would prove disastrous, not only to the economy but to the very social fabric which makes this country great. How can anyone trust such a liar who changes his position like a chameleon. Regarding the economy, most CEO's and major coorporations back Obama's plan to move the economy forward. He and his wealthy cronies would be the only ones to benefit. Can anyone really trust a TAX evader who keeps his wealth out of the US? They need to be smart this is not a good thing to. I tell you Romney wants to start wars with everyone. Wow! liar & lyin' are desperate! Thank goodness we only have 5 more days before they lose and their heads explode, and we never have to hear from them again. My sSpanish isn't too good, so forgive me. Romney el sucko! By the way, could somebody explain something for me? I've been waiting 12+ years for this explanation and have yet to hear one. How, exactly, is it worse to be a tax-and-spend Democrat than it is to be a don't-tax-but-still-spend Republican? Anyone? Nice Try , Rubio must have thought that one up !